LONDON, England -- England football fans going to Ukraine for Euro 2012 have been told to beware extortion and even torture by the corrupt local police. 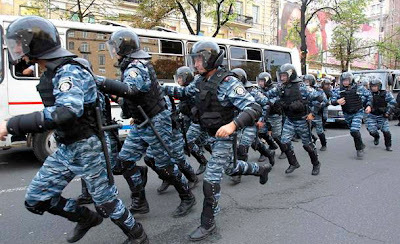 The Daily Mail has quoted a statement of human rights group Amnesty International, as saying that many police in Ukraine are a law unto themselves. The draw for next summer's finals means England must play all three group qualifying matches in Ukraine. John Dalhuisen, of Amnesty International, said: "Officers in Ukraine frequently abuse their powers to extort money or torture detainees into confessing to crimes they are under pressure to solve." They are rarely held accountable for their actions. Dalhuisen added: "With thousands of international fans converging on Ukraine, there is a danger that they may suffer at the hands of a police force with no concept of public service." England's first game will be against France in Donetsk on June 11.